Hydatidosis is an endemic, widely distributed anthropozoonosis, which involves the liver, lung and other organs . We reported the case of a retroperitoneal hydatid cyst, which is a rare situation. Diagnosis was suspected during surgery after complete resection of the cyst and confirmed by a histological examination. We report the case of an old patient ( 74 years old) without significant medical history who has a right retroperitoneal tumor, discovered during an ultrasound done for low back pain without other signs associated . The CT urography showed a right mass of tissue density and thick-walled heterogeneous necrotic center measuring 54mm / 60mm interposed between the lower pole of the kidney and the posterior and lower segment VI of the liver occupying the paracolic gutter behind the lowland caecal .The patient had a complete resection of the mass and pathological examination concluded retroperitoneal hydatid cyst The patient received in postoperative albendazole tablets at a dose of 15 mg / kg per day. The total dose was administered three weeks with biological monitoring liver. With a follow up of 6 months , the clinical and paraclinical control is normal. Echinococcosis is a disease that can affect any organ of the human body. Isolated retroperitoneal localization is very rare. Although the original tumor is more frequent in this location, hydatidosis, parasitic disease, must always be in mind especially in patients from endemic areas. Hydatidosis is an endemic, widely distributed anthropozoonosis, which involves the liver, lung and other organs . We reported the case of a retroperitoneal hydatid cyst, which is a rare situation. 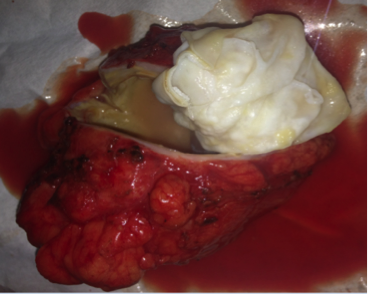 Diagnosis was suspected during surgery after complete resection of the cyst and confirmed by a histological examination. Figure 1. Lesional process heterogeneous tissue density and thick-walled necrotic center measuring 54mm / 60mm interposed between the lower pole of the kidney and the posterior and lower segment VI of the liver occupying the paracolic gutter behind the lowland caecal. We report the case of an old patient ( 74 years old) without significant medical history who has a right retroperitoneal tumor, discovered during an ultrasound done for low back pain without other signs associated . The CT urography showed a right mass of tissue density and thick-walled heterogeneous necrotic center measuring 54mm / 60mm interposed between the lower pole of the kidney and the posterior and lower segment VI of the liver occupying the paracolic gutter behind the lowland caecal(pictures A.B.C) .The patient had a complete resection of the mass(pictures D.E:F) and pathological examination concluded retroperitoneal hydatid cyst ;The patient received in postoperative albendazole tablets at a dose of 15 mg / kg per day. The total dose was administered three weeks with biological monitoring liver. With a follow up of 6 months , the clinical and paraclinical control is normal. Figure 2. 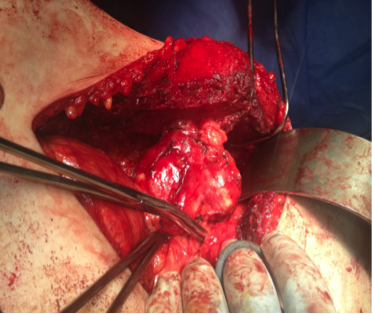 Intraoperative picture showing a retroperitoneal tumor. Hydatid cysts located in the retroperitoneum, especially around or in the kidney are rare and represent 5% of visceral. Organs most commonly affected are the liver and the lung [1, 3, 6]. The main symptoms of the disease are pain sides and gastrointestinal symptoms nonspecific such as nausea and vomiting. In cases most common found on clinical examination a mass abdominal farm rarely responsible for a syndrome compressive [4, 7]. Clinical and laboratory tests not providing sufficient specificity, it can be difficult to diagnose preoperatively . Figure 3. 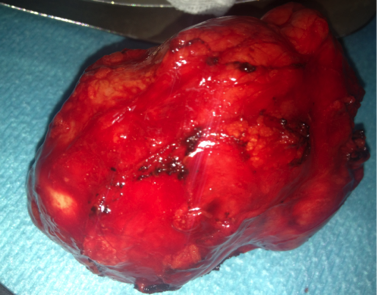 Image showing a tumor mass after complete resection. Eosinophilia exists in 20 to 50% of cases. This is particularly increased in the case of cracking the cyst. Sero-immunological reactions guide diagnosis in cases of doubt. In practice, serologic tests hydatidosis are less realized because of their low reliability. They are recommended only case of diagnostic doubt . Figure 4. Image showing the appearance of the tumor after its opening suggesting a hydatid cyst. It appears that, among all radiological examinations, CT provides the best profitability . We propose, in the majority of cases of hydatidosis, a mixed treatment combining surgery and albendazole, by conventional open, laparoscopic [9-12] or percutaneous Protocol (Percutaneous Suction Introduction of a protoscolicidal agent and rebreathing [PAIR] ). The choice of technique the most suitable shall depend on the patient (age, comorbidities, individual preference), characteristics cyst (cyst number, size, potential complications) and operator (experience and means available). The retroperitoneal cyst is best for minimizing the risk of peritoneal seeding [6, 9, 12]. Goel et al. advocate preoperative albendazole (10-15 mg / kg per day), with or without praziquantel (50 mg / kg per day) for a period of four week.. This protocol may reduce the antigenicity Content cysts and the voltage at their walls thus reducing the risk of swarming. this treatment medical should be continued for at least one month postoperative price possible liver toxicity . Despite the rapid development of new techniques in laparoscopy, few publications have described this minimally invasive approach to treat hydatid cysts [9-12]. The risk of swarming content of cysts is most significant elevated pressure necessary to create pneumoperitoneum. This is the main disadvantage the laparoscopic approach . However, an advantage of laparoscopy is the possibility to excised hydatid cyst wall. Laparoscopy is indicated in the retroperitoneal masses isolated and completely resectable (complete excision, nephrectomy partial or total nephrectomy) because of the risk increased contamination in case of partial resection [9, 11, 12]. Whatever the surgical technique used, recurrences Postoperative exceptional. The few cases reported are relapse parietal [5, 15, 16]. Finally, we must emphasize the clinical, immunological, radiological and ultrasound during regular many years for early detection of any recurrence or secondary appearance of other sites. careful of potentially contaminated fruits and vegetables and the reduction of direct contact with dogs (which are the main host of the parasite). Echinococcosis is a disease that can affect any organ of the human body. Isolated retroperitoneal location is very rare. Although the original tumor is more frequent in this location, hydatidosis, parasitic disease, must always be in mind especially in patients from endemic areas. The first author wrote the article and participated in the care of the patient. Other authors have made the correction of the article and participated in the care of the patient. All authors have read and approved the final manuscript . Professeur A. Janane and Dr. A. Hamdoune recommend publication of this article. Ameur A, Lezrec M, Boumdin H, Touiti D, Abbar M, Beddouch A. Le kyste hydatique du rein. Traitement à propos de 34 cas. Progrès en Urologie 2002;12:409—14. Ketata H., Peyromaure M. Kyste hydatique du rein. Encyclopédie Médico-Chirurgicale; 18-100-A-15: 1—5. Leder K, Weller PF. Treatment and prevention of echinococcosis. Up to date Online 15.2. Fekak H, Bennani S, Rabii R, Mezzour MH, Debbagh A, El Mrini M, et al. Kyste hydatique du rein : à propos de 90 cas. Ann Urol (Paris) 2003;37:85—9.